Francisca Nunez had been charged with two counts of criminal mischief. Charges against her were dismissed on Sept. 13, 2018, according to a court document received by the Paterson Times. “Dismissed Lack of Prosecution,” reads the municipal court dismissal document. 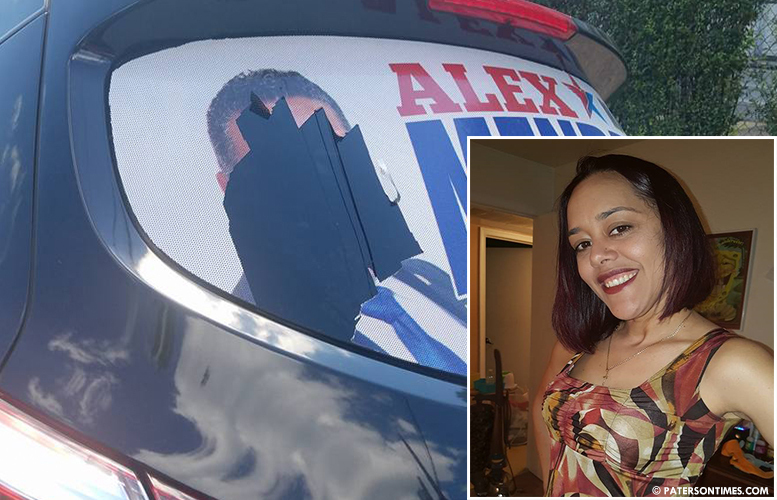 She had been accused of targeting vehicles that conspicuously displayed Mendez’s campaign decals. Surveillance footage showed someone that looked like Nunez getting out of a Lexus SUV and slashing tires. Nunez demanded an apology from the municipal government. She also named some of her accusers at the meeting while holding up their portraits. She said Mendez, Gregorio Diaz, Eduardo Lanchipa, and Jacqueline Gomez falsely accused her of committing a crime she did not. “I was not aware the case was dismissed,” said Mendez on Thursday morning. He said he did not formally accuse Nunez, but that his team presented evidence to police for investigation. Mendez said he was “disappointed” at the way law enforcement officials handled the investigation. For example, he said, police refused to charge the driver of the Lexus. He said the license plate was visible in the footage provided to police. The tire slashing had a chilling effect on his supporters, said Mendez, who finished second place in the race. “I’m glad he didn’t win,” she said. Mendez appeared to criticize Nunez for her appearance at the council meeting. “That was a political joke what you saw at the City Council,” said the former councilman. Phone numbers were not available to reach Diaz, Lanchipa, Gomez for their comments for this report on Wednesday. Lanchipa is among the 17 people running for five school board seats in November. Nunez made it a point to mention his candidacy at the meeting to some noise of shock from some of the attendees at the meeting. “That was a knife through my heart,” said Nunez. The speech Nunez made at the meeting can be viewed below. Video was supplied by Mario Rondon, a close friend of Nunez’s. It clearly says there's a second person that owns the Lexus. Nunez was charged, the driver wasn't. Establishes two people. Therefore she don't own the Lexus SUV. "Surveillance footage showed someone that looked like Nunez getting out of a Lexus SUV and slashing tires." "For example, he said, police refused to charge the driver of the Lexus. He said the license plate was visible in the footage provided to police." Mendez has video on his Facebook, I belive.